Seattle Mariners shortstop Jean Segura. UPDATE [5:15 p.m.] — It's official. The Phillies have announced they've acquired shortstop Jean Segura, right-handed pitcher Juan Nicasio and left-handed pitcher James Pazos from the Seattle Mariners in exchange for infielders J.P. Crawford and Carlos Santana. The prize of the deal is 28-year-old Jean Segura, who plays just the kind of baseball manager Gabe Kapler likes — and the fact that he's played second base for a full season in the past means that the team could still sign Manny Machado to play shortstop. Last season, Segura slashed .304/.341/.415 and made his second All Star appearance, while also posting his third straight season of a plus-.300 batting average, something only three other players have done (Mike Trout, Jose Altuve and Freddie Freeman. In 2018, Segura took 1,080 swings, and missed on only 136 of them, posting a 12.6% whiff rate, the fourth-best mark among all qualified hitters in the majors. Conversely, of those 1,080 swings, 527 of them were put in play, resulting in the ninth-best contact rate in the majors (48.8%). Since the start of the 2016 season, Segura has accrued 13.0 bWAR, which ranks fourth-best among all major league shortstops with at least 200 games at the position over that span, trailing only Francisco Lindor of the Cleveland Indians (19.3), Andrelton Simmons (17.4) of the Los Angeles Angels and Carlos Correa of the Houston Astros (14.0), per Baseball Reference’s variation of the metric. For his career, Segura has hit .287 with 154 doubles, 36 triples, 64 home runs, 316 RBI and 171 stolen bases over his seven-year career. But Segura wasn't all general manager Matt Klentak was able to get in return for Santana, last winter's big free agent signing, and Crawford, a former top prospect. Nicasio, 32, made 46 relief appearances for the Mariners last season and tallied 53 strikeouts to only five walks in 42.0 innings pitched, as he posted the best strikeout-to-walk ratio among all American League relievers (10.60 SO/BB). He previously appeared in two games for the Phillies during the 2017 season after being claimed on waivers from the Pittsburgh Pirates on Sep. 6, 2017. Among all relievers with at least 100.0 innings pitched over the last two years, Nicasio’s 2.98 FIP is 17th-best in the majors. Pazos, 27, posted a 2.88 ERA over 60 relief appearances, 13th-best among all left-handed relievers in the majors last season. Over the last two seasons, Pazos has faced 175 left-handed hitters and struck out 48 of them (27.4%). 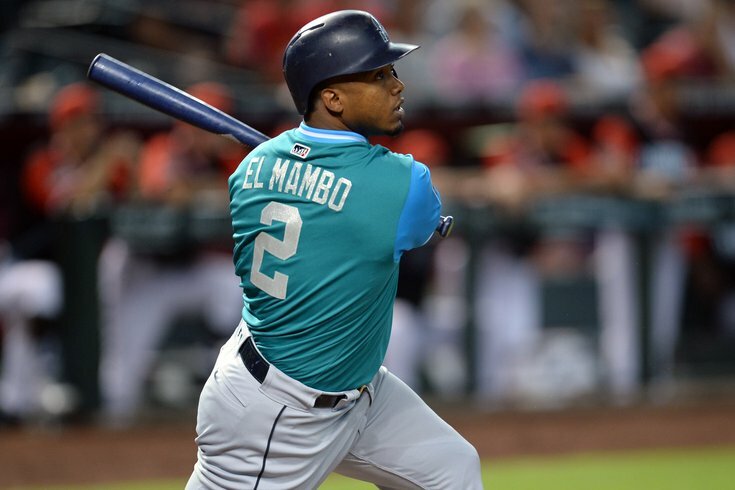 UPDATE [4:20 p.m.] — According to multiple reports, the Phillies' deal with the Mariners for shortstop Jean Segura looks like a win for general manager Matt Klentak. So as @Ken_Rosenthal first reported, the #Phillies acquire Jean Segura, Juan Nicasio and James Pazos. The Mariners get Carlos Santana and J.P. Crawford. That's it. No other prospects or cash exchanged. On Sunday night, news broke that the Phillies were close to making their first big move of the winter, but it's not one of the two free agent signings you were likely hoping for. Instead, according to Ken Rosenthal, the Phillies are on the cusp of a trade with the Mariners that would bring two-time All Star shortstop Jean Segura to Philly. There's no official word on who would be sent back in return, but according to Ryan Divish of the Seattle Times, the Phillies will be sending Carlos Santana, former top prospect J.P. Crawford and possibly others to Seattle in exchange for Segura. Major League Baseball sources confirmed Sunday evening that the Mariners were working toward finishing a trade that would send All-Star shortstop Jean Segura and possibly one other player to the Philadelphia Phillies in exchange for a package of players including first baseman Carlos Santana and shortstop J.P. Crawford. But the trade isn't a slam dunk just yet. While early reports suggested that Segura, who hit .300 or better in each of the last three seasons, would waive his no-trade clause in order to be dealt from a Seattle team that is in full-on sell mode. That, however, hasn't happened yet. Besides the medical reports and other details, there is one other aspect of the trade that needs be solved before the trade becomes official — Segura’s full no-trade clause. After being traded three times in his career, Segura demanded a full no-trade clause in the five-year, $70 million contract extension he signed with the Mariners in the middle of the 2017 season. And according to Segura's agent, the 28-year-old shortstop is still weighing his options. For those wondering what this means for the Phillies quest to land prize free agent Manny Machado, who recently moved back to his natural position of shortstop, it may not be the end of the line. Per Jim Salisbury of NBC Sports Philadelphia, the Phillies plan to sell Machado on playing third base again. So how does that impact the Phillies' desire to sign free agent Manny Machado?